For the adventure seekers amongst you we now have on line with the RAAus school an Airborne Microlight Trike. 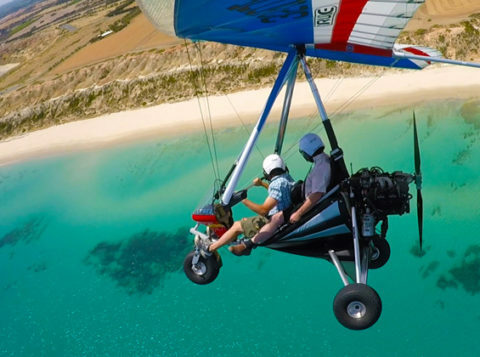 This aircraft is a weight shift microlight “trike” paired with an Australian built Airborne wing allowing access into the world of microlighting. This aircraft is powered by the 4 stroke Rotax 912 of 80 horse power which ensures power to spare, reliability that is becoming legendary, as well as smooth quiet operation. Most of you will know by now that Stewart Bond who instructs for us on the SportStar, the Cub and the Champ, has another string to his instructing bow, the world of weightshift. He is very experienced in both the world of hang gliding as well as the powered derivatives. If you think this “out there in the wind” experience is for you, then just call up and book your Trial Instructional Flight, 30 minutes airborne, $150-00.